It seems like a recognizable name in craft beer dips its toe into cider from time to time, and a few months back, New Belgium announced it would make the move. Samuel Adams, Cigar City and others have taken on ciders in addition to a lineup of ales and lagers, which not only gives their faithful followers another beverage option, but helps draw in the masses that prefer the drinks made from fruit over a beer. 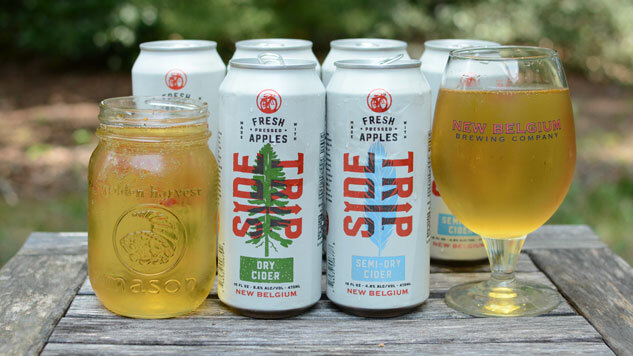 New Belgium’s Side Trip Ciders, not to be confused with its Belgian Style Pale Ale by the same name, offer two (very similar) options for those who prefer apples over hops. Both of the ciders are fermented with fresh-pressed apples, offering a fresh fruit taste that’s not overly sweet. The brewery says that these two are the result of a five-year quest that took it to the Pacific Northwest, Vermont and Western North Carolina in search of the ideal American apple varieties, seeking guidance from master cider makers. Let’s find out if you should bypass the Woodchuck and Angry Orchard for one of New Belgium’s latest, shall we? These two ciders both have a golden color that looks just like a glass of apple juice, but the Dry Cider is slightly lighter in appearance. Just like you would expect, it pours with almost no head and a minimal amount of carbonation—a trait that ciders tend to exhibit. Of course, you do still get those tiny bubbles from the bottom of the glass. The nose is dominated by aromas of tart, fresh cut Granny Smith apples and a little bit of white wine. There’s no spice or other ingredients present here, just a heavy dose of those fresh-pressed apples with the slightest hint of some white wine-like notes. I tend to prefer dry ciders over the sweeter options, and that’s the case here as well. New Belgium’s Dry Cider has plenty of flavor without being overly sweet, aside from the sweetness the fruit naturally imparts. The dryness comes in on the finish of a sip that’s clean and straightforward. No cinnamon, ginger or other spices are used here, and the absence of those extras gives this cider a more natural flavor than some other craft options. A lot of times, hard ciders leave my teeth feeling like a just drank a soda, but that’s certainly not the case here, even after a couple of 16 oz. cans. As I already mentioned, the Semi-Dry option pours a golden hue that’s ever so slightly darker than the Dry Cider. Unless you look at them side-by-side in the right lighting (I did so outside), they’ll look exactly the same. You also have to look, or smell, closely to pick up on the differences in the nose. While the Dry Cider has more of the tart Granny Smith character with a hint of white wine, the Semi-Dry Cider smells just like a glass of apple juice. Even in the aroma, it’s more sweet than dry and tart. In fact, that’s the biggest difference between the two: the level of sweetness. Staying true to the nose, the Semi Dry Side Trip Cider is indeed sweeter than the Dry version, but still not overly so. The Semi-Dry Cider is also very clean and straightforward when it comes to flavor, only this time the fresh apples are more like a Gala or Fuji than the aforementioned green variety. There are some subtle wine-like notes here as well, but they aren’t nearly as pronounced as what I tasted in the Dry Cider. There’s also a slight hint of tropical fruit and melon, but I only started to notice those after several minutes of trying to pick out anything other than the great apple flavors the cider has. Overall, both of these are really great ciders, offering a sweet and not-so-sweet option for the low ABV apple beverages. Availability: 4-Packs of 16 oz. cans in Colorado, New York, North Carolina and Chicago.